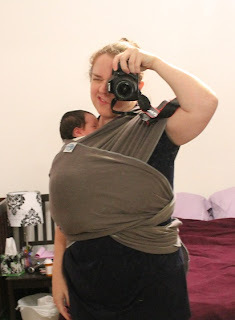 We have a variety of baby carriers -- Baby Bjorn, Moby, Ring Sling. I'm not sure what the baby likes. She let Daddy carry her around the back yard in the Baby Bjorn (another hand-me-down -- hurrah! ), and I was able to hold her in the Moby for a bit. I think both times she was sleeping. Not sure how she feels about being carried when she's awake. The ring sling has had mixed success. But we'll keep trying. It's the prettiest carrier of all -- it's purple and a gift from Gingie!